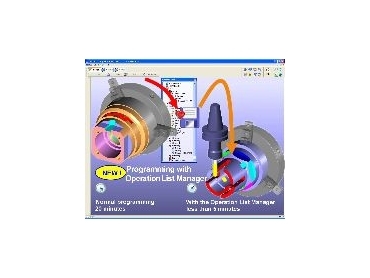 Features include substantial time cuts for generating CNC programs. MISSLER Software, represented in Australia by CIM solutions , recently unveiled GOelan 2006 at EMO Hannover. This new version has been designed to maintain the same trend adopted three years ago - making high quality CAD/CAM software accessible to all CNC operators. GOelan 2006 clearly answers the following important questions - how to reduce the time needed to generate CNC programs and how to reduce machining times and optimise the use of machine tools. Three features have been added to GOelan 2006 - Operations Lists Manager, Multiple Part Machining and enhanced CAD interoperability. Most workshops work on similar parts or are specialised in a specific field of machining. The geometry of the parts to machine, the materials, tools and cutting conditions are the same. Machinists are constantly tuning their cutting techniques and parameters to achieve their targets in terms of part quality or machining times. The toolpath generation involves three selection stages, whatever the CAD/CAM software used - the geometry (a wireframe contour or a solid), the machining strategy (contouring or pocketing) and the tool (a ball end or flat end mill). The machining strategy includes many parameters like depth of cut, tool step over, lead in/out moves and defining the correct strategy can be quite time consuming. GOelans 2006's Operations Lists Manager (OLM) offers the possibility to reduce the toolpath generation process to only one step - selection of the geometry. The operator can save the strategy, tool and cutting conditions used to machine a part and create specific predefined Operations Lists. When it comes to machining a new part, the operator simply picks the appropriate Operations list and applies it to the new geometry. * Make new operators share the same cutting techinques as experienced operators. Use of machining centres and Flexible Manufacturing Systems (FMS) help attain the productivity levels required by today's competitive markets. Production series are shorter and machining centres are loaded with different parts. The CNC programming of such production runs needs to be simple and flexible, while being capable of generating the optimal toolpaths to maintain minimal machining times. GOelan's new MPM allows operators achieve this. The simplified user interface used in GOelan's MPM can be easily used by any CNC operator in the workshop near the machine tool. GOelan's MPM environment allows parts to be placed onto the tombstone fixtures just like with a CAD assembly. The Stock Manager calculates the stock so as to position the parts correctly for each setting. The Toolpath Optimiser finally analyses and sorts all operations in order to ensure the shortest machining times are achieved. The Collision Manager verifies the toolpaths to ensure there are no collisions between the tool/toolholders and the clamping systems of the tombstone fixture. MPM keeps a link with the original parts. If a change is made to the geometry or the Operations list of any part of the assembly, then the whole assembly will be updated automatically. * Generation of correct complex machining settings in the workshop. In a solid CAD software, a hole, regardless of its technological information, is defined as a simple cylinder. When retreiving solid CAD data, the machinist does not find information about the tolerances and depth of tapping threads. This is why 2D drawings are still necessary to communicate the design intent of the CAD engineer to the CNC operator. GOelan 2006 introduces Enhanced CAD interoperability - it is now possible to scan the CAD data and extract the technological information necessary to the appropriate hole features machining. The quality of a reamed hole, the tolerances and all parameters of a tapped hole are transformed from the CAD software directly into the machining parameters of GOelan 2006. When this data is imported into GOelan 2006 the software can choose the correct machining sequences, tools and cutting parameters. After validation of the Operations Lists by the CNC operator, the machine can be started. * Automation of machining of holes.